There are simply hundreds of little things that can go awry on any given day. This is especially true following a SHTF event when resources are scarce and things are chaotic. When you begin to understand this, you realize that you cannot possibly carry every piece of gear or equipment you need on hand when you are faced with a life-threatening or survival situation. Experienced preppers know that the key to being prepared is to carry as many items as possible that have multiple uses. The items that can be used in a variety of different ways in a survival situation are those that hold the most value especially when the chips are down and you are face to face with danger. The age-old saying “two is one, and one is none” suddenly makes perfect sense. Paracord 550 is a piece of equipment that no experienced prepper would want to be without ever. 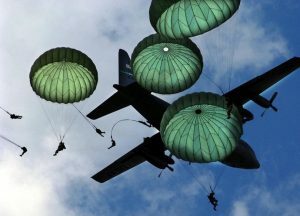 It was first used, as suspension cord for parachutes, by the military and has been around for decades. 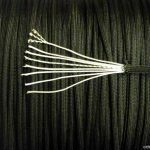 Paracord is typically made of nylon and has multiple inner strands, usually 7 strands for 550 cord. You can carry paracord in several hundred feet lengths in your bug out bag or attached to your backpack. If you’re into fashion, paracord comes in a wide range of color choices too. If you have a real desire to be prepared no matter what life throws at you, get yourself a paracord bracelet. These bracelets can be worn at all times, around the wrist or even the ankle, so you always have it with you. A good reason to always have some paracord with you is in the event you or someone in your group is injured. 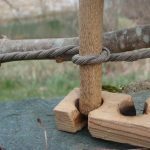 You can use paracord to make a tourniquet. Also as sutures to help stop a cut from bleeding. Paracord can come to the rescue if someone breaks a bone. 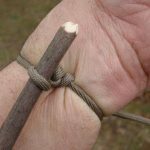 It can be used in combination with several sturdy sticks or branches to create a splint. 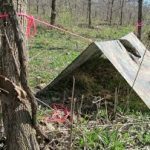 In a pinch, you can even use paracord in conjunction with long sturdy branches and a tarp or even a jacket to create a stretcher to carry someone in your group to safety. When you find yourself alone in the remote outdoors or following a SHTF event, paracord comes in handy to give you some extra leverage you may need. It can be used to tow something heavy, such as a large branch that has fallen over the road. You can also use paracord with other objects to create a pulley system. In this manner it will allow you to lift other objects into the air. Whether you are camping in the outdoors or stuck there following a SHTF event, securing your camp, from animals or those who would otherwise do you harm is paramount. 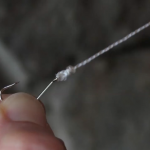 Use paracord to set a trip wire or to create a perimeter around your camp. Be alerted to the presence of danger approaching. To help protect yourself against enemies when you don’t have your gun or another weapon with you, use paracord to make a monkey fist weapon. Another thing that becomes oh so critical when you are trapped in a remote area for any length of time, is food. Paracord can come to your rescue for this as well. Use paracord as fishing line or a trot line to help you catch fresh fish for dinner. The internal strands of paracord can be used to make your own mesh net to catch fish, small birds, or even to carry something you’ve collected back to camp. 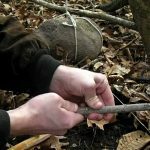 If small game is more what you had in mind for dinner and your aim is true, use paracord to lash your knife to a sturdy branch and make a spear. If you’re not sure you can hit a moving target, find a game trail and a length of paracord to make a snare trap and catch a rabbit or squirrel. Hypothermia is one of the most frequent causes of death and injury for hikers and others who are stranded outdoors. One of your first priorities, when you’re lost or trapped at the mercy of Mother Nature, is building a shelter. If you don’t have materials with you, you can unravel your paracord bracelets. Use them to lash branches together and create a basic shelter that will keep you protected from the elements. 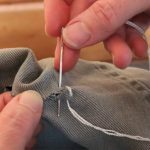 You can also use paracord to sew holes in your tent, clothing, or backpack so you can keep yourself dry and warm throughout the night. Once you have your shelter in place, use paracord as the string to start a fire using the bow method. Keep your feet dry by using paracord. Tie garbage bags to your feet for extra protection from rain or high water. Hiking or going out on a supply run from your makeshift mountainside BOL? Being able to find your way back to safety is crucial. Paracord can be used for marking a trail so that there is no doubt which way will lead you to safety. You can use paracord to replace your shoelaces when yours wear out. Keep shoes on your feet and avoid getting cuts that could get infected. When someone in your group is trapped in the water, instead of using some type of rope or vine you can use paracord as a lifeline. Pull them through the water to safety. Need a way to get to higher ground or to escape from the second-story window of your apartment building? Use paracord and several sturdy branches to create a foldable makeshift ladder for your bug out bag or backpack. By now it should be obvious that there are multiple situations where paracord can save your life. But in order to use this little piece of miracle equipment to its full potential, you have to do two things. Keep your paracord on your person as much as possible. Know in advance all the different ways that it can be used. Get your paracord bracelet today and while you’re at it, get a couple for your family members too! Previous: Previous post: Outdoor Adventure & Essential Skills!